RiverLink's RiverMusic continues Friday, June 12 by the French Broad River in the River Arts District of Asheville with headliners The Ben Miller Band. This free concert takes place at The RiverLink Sculpture and Performance Plaza in the River Arts District (map). Gates open at 5. The music starts at 5:30 with local act The Toothe, followed by The Red Dirt Revelators at 6:45 and headliner Ben Miller at 8:15. Former Washington Post music critic Joe Sasfy says of the evening's entertainment, "My own sense of anticipation peaks on June 12 when the Ben Miller Band headlines what should be an evening of rowdy Americana. 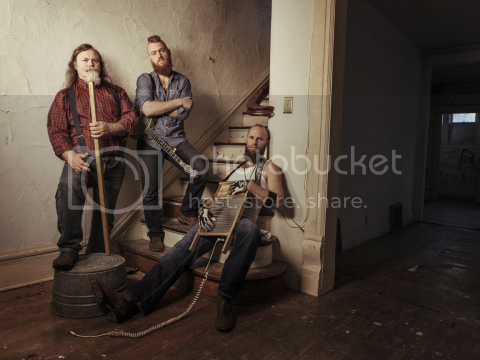 This Missouri trio wowed 'em as openers for rock legends ZZ Top, and have been turning heads and twisting ears everywhere with the inspired fusion of bluegrass, delta blues and old-timey they call 'Ozark stomp.' The band looks a little weird, plays some eccentric homemade instruments, but is no joke. This is one totally original, explosive American band that seems a perfect fit for Asheville. The evening's tone will be set by Asheville's alt-folkies, the Toothe, and a tough electric blues band from Hickory, the Red Dirt Revelators." RiverMusic has always been solar powered by long-time partner Sundance Power Systems, Inc. None of this would be possible of course without the support of sponsors, including the Chaddick Foundation, Prestige Subaru, Pisgah Investments, Heira Productions, New Belgium Brewing, Sierra Nevada, Highland Brewing, Twin Leaf Brewing and Catawba Brewing along with our media sponsors at Mountain Express and WNCW. RiverMusic is designed to be multi-modal, with plenty of bike racks for locking bikes, while a boat access allows attendees to arrive by canoe or kayak or tube. Trolleys we will be running from the Asheville Area Chamber of Commerce at 36 Montford Avenue (map) and Grace Baptist Church at 718 Haywood Road in West Asheville (map). Dogs, outside food and beverages are not allowed on the festival grounds, but attendees are encouraged to bring picnic blankets and lawnchairs. RiverLink is the regional non-profit working to revitalize the French Broad River and its tributaries as a place for everyone to live, work and play. Funds raised by this series of concerts will go right back into the Asheville community. RiverLink's most recent audit documents that 85 cents of every budget dollar is spent on greenways, parks, water quality improvements, etc.